Gunrunning was one of the biggest updates that overhauled GTA Online’s library of content. Released in June 2017, it focuses on much larger operations and criminal activity, giving you the option to become the boss or an associate in your own criminal organization. As everyone knows, crime pays. Gunrunning missions, while incredibly expensive, can help earn you a good amount of cash. The kicker is, once you have your business up and running, your bunker will keep working even if you’re out working on other missions or just messing people up in the classic Grand Theft Auto way. Gunrunning is a complicated update, and it’s divided fans with how difficult it can be to get things running and figure out the best options. It’s also just downright expensive! Bearing all that in mind, we've put together these tips to help you make the most of your time as a criminal mastermind. The bunker is the core of the Gunrunning update, as you can’t do anything until you buy one. Like other pieces of property in GTA Online, you can only own one - so you’ll need to choose the one that lines up with your goals. If you try to purchase two, your base of operations will move to the new one and your old one will get sold off. While everyone has their own favorite bunker, a few choices that are well rounded include Raton Canyon for its affordability, location, and view; Chumash for its central location between the city, country, and several mission locations; and Smoke Tree Road for a number of reasons including how empty it can be due to fewer players using it. Getting your Gunrunning operation up and running is quite difficult, as some players have spent millions to get things off the ground and haven’t been able to recoup that money. Therefore making the correct choices is important, if you want your change purse to remain intact. It’s also important to know that Gunrunning shouldn’t replace other methods of making money, like hunting down cargo drops and doing CEO work. One of the main activities you can start, once the set up missions are complete, is manufacturing weapons and equipment for sale. The most efficient method is to put all your resources into manufacturing at first, and using the money you get from that to fund research. Research, which unlocks new weapons and upgrades for weapons and vehicles, is another activity that owning a bunker unlocks. You have to balance it out with your manufacturing objectives though, and putting money towards research can seriously hamper production. The unfortunate part that’s difficult to get around is that research assignments are random, so you can’t choose what you want to focus on specifically. Due to that restriction it’s important to use the fast-track option, which can speed research up by spending about $225,000. It’s a pricey ask, but is worth it for upgraded equipment - and it beats the alternative of waiting almost 250 hours to research all of the topics. The Mobile Operations Center, or MOC, seems like a waste at first, as it’s expensive and it’s unclear what it actually does. 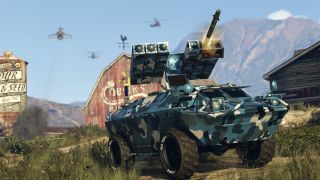 But the trailer is useful if you’re into Gunrunning for the long haul, as owning one is the only way to upgrade the new Warstock vehicles, buy the Mk. II weapons, and get access to missions that lead to lower prices on equipment. Only two upgrades on the MOC are important early on, which are the first Command Center upgrade as it unlocks turrets on the front and rear of the vehicle, and the Vehicle and Weapons Modification Bay that unlocks upgrades for new vehicles and the Mk. II guns that can’t be found anywhere else. The weapons unlocked with these upgrades are incredibly powerful and worth the extra effort to obtain. A little side perk of jumping into the Gunrunning mode is that if you need to lose a wanted level fast, all you need to do is enter your MOC’s trailer and the wanted level will disappear instantly. It’s a nice little add on if you want to cut through the noise and get back to working on serious business. Supplies are the lifeblood of Gunrunning research and manufacturing, as they are the resources you need to actually get things done. When you start out, your 100 supplies - the maximum amount your bunker can hold - will get used up in less than two hours, so you’ll need to keep resupplies in mind. Resupplying can be done through both purchase and theft. You’d think that stealing supplies would be the easier option, but in actuality buying them is more efficient. Missions to steal supplies can be long and tedious, while purchasing supplies can be cheaper and better for the long run. A big part of the discussion about Gunrunning is how to completely optimize profits which, while fun, can be demoralizing, as Rockstar wants Gunrunning, and GTA Online in general, to be a huge time sink and revenue generator. It’s ok to spend a lot of time online, but remember to actually enjoy the missions, weapons, and perks that Gunrunning has to offer. Don’t get into it just to have another responsibility while online.